This is a really good strategy game for 3 or 4 players. 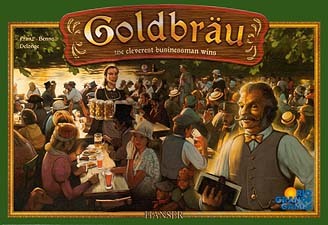 The board depicts 6 beer gardens surrounding a central area with tables. These beer gardens are served by 4 breweries. Each player starts with some money and some share markers, plus three action cards. Each turn, players simultaneously reveal one of the action cards. Expand: A player gets to expand a brewery he owns by one table. if the player is the only one choosing this action he gets to expand two tables. Boss/Contract: A player can place a boss in a garden without one or overthrow a boss in an occupied garden, if you have enough shares there. Or you can change the contracts between brewery and beer garden if you have a boss in both. Again, doing this action on your own lets you do this twice. Share Card: Obtain a share card from one of two face up on the table, or draw a blind one. This works slightly differently than the other two actions, as doing this action on your own lets you get the card for 2 Thaler. Otherwise it costs more! After 7 rounds scoring occurs and after 21 rounds there is a final scoring and the game ends. You do not know who has won until that final count! A really enjoyable game with some nice strategy involved.